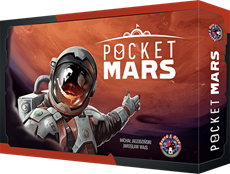 Become an architect of a future colony on the Red Planet in Pocket Mars, a new dynamic card game by Board&Dice. The main objective in Pocket Mars is the preparation of an infrastructure that will allow more colonists to move to Mars. Players will undertake projects to send their colonists to Mars, where they will work in preestablished buildings to improve and upgrade the colony, as well as build new constructions that will allow the colony to prosper. The player who most effectively allocates their colonists will score the most points and be victorious.